When you’re an expecting wedding photographer, you have a lot to consider and it starts, well, right away. Shooting weddings in the first trimester is interesting. Some might argue that it’s actually the most challenging time for a photographer – hell, some say that it’s the most challenging trimester over all for everyone. These are my thoughts on shooting weddings in the first trimester of pregnancy. One of the biggest struggles during the first trimester is morning sickness and so shooting weddings in the first trimester can be downright turning turning for some mamas. For some unlucky ladies, they begin suffering from morning sickness before they even realize they are pregnant. If you are one of the lucky ones who hasn’t had morning sickness then, wow – I am SO jealous. Morning sickness can be really inconvenient for some people and downright debilitating for others. While morning sickness usually disappears early into the second trimester, for some moms-to-be, the morning sickness continues on through the length of their pregnancy. Like me. Ugh. It’s rough. But I digress. Morning sickness can be challenging for a wedding photographer because your workdays are long and there are countless important moments during the day that you have to be there for to capture. If you’re starting to feel nauseous as the bride begins her walk down the aisle, if you run to the bathroom (or to the nearest garbage can) then what happens to the pictures? 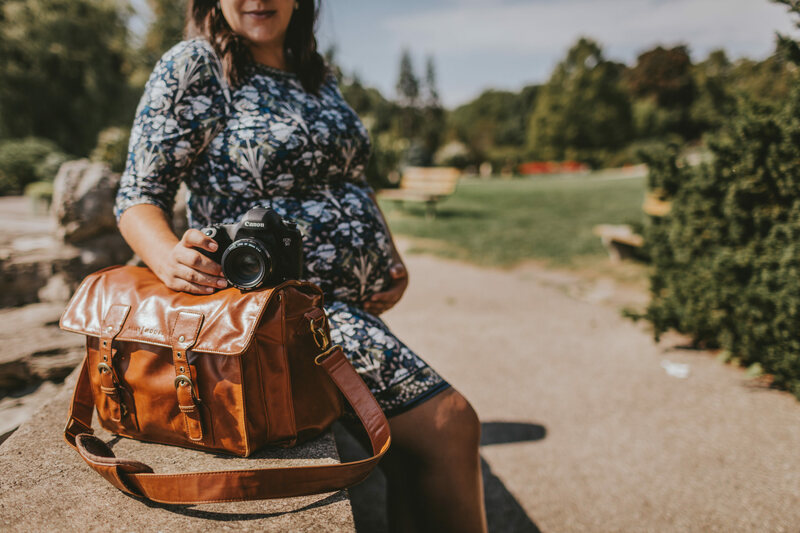 This is where having a second shooter comes in very handy as dealing with morning sickness is one of the “what if’s” that you should consider when making your business plan around your pregnancy. The other super nasty first trimester symptom is exhaustion. Like morning sickness, exhaustion can be downright debilitating for some mamas. Pregnancy fatigue is unlike any other fatigue I’ve experienced in my life. It’s like every single molecule of your body is exhausted. Tackling the 12-hour wedding days while dealing with exhaustion is immensely difficult. Again, having a second shooter to help out is great because they can drive from location to location while you take a quick nap in the car or they can cover the cocktail hour while you rest up a bit. Some moms-to-be can’t do the double (or triple) headers once they’re pregnant as they find them too physically exhausting. Unfortunately if these weddings are already booked, backing out at the last minute due to exhaustion wouldn’t bode well for position reviews. For anyone who has back-to-back weddings, I’d suggest making sure you have an exceptionally strong second shooter for the second wedding – someone strong enough to be the primary. That will help you out immensely. Another great way to deal with exhaustion is to outsource. Notice how I didn’t say outsource your editing in particular? That’s because there are other things you can outsource besides editing. Basically, you need time to rest. But you also need to shoot, edit, consult with new clients and house clean, do laundry and cook. If you don’t want to outsource your editing, you can outsource the other things in life. You can outsource your laundry – there are services that will come right to your door and pick up your laundry for you. You can outsource your cooking. You can either sign up for services that deliver pre-made meals or that deliver meal boxes so your house so you can prepare easy dinners. You can outsource your grocery shopping. Plenty of grocery stores have online shopping and delivery available and you can even save your grocery list so you can repeat your weekly grocery order with the click of a button. You can outsource your cleaning by having someone come in once a week to do the tidying. That leaves you all the time in the world for your business. Whether you choose to outsource the tasks in your personal life or the tasks in your business, outsourcing is a great way to treat yourself to the gift of rest! Finally, the last challenge of shooting weddings in the first trimester is that you’re usually keeping all these nasty side effects of pregnancy a secret. Most moms-to-be won’t tell the world about their pregnancy until week 12 or later which means those first few months of pregnancy are spent keeping the biggest secret in the world all while trying not to throw up while shooting a first dance. Ah, it’s a glorious time.